The annual State Vesak Festival 2014 will be held centred around the Polonnaruwa district throughout the Vesak Week under the patronage of Prime Minister D.M. Jayaratne. Buddhasasana and Religious Affairs Ministry officials are making arrangements to hold the festival on a grand scale under the guidance of the Prime Minister who is also the Buddha Sasana and Religious Affairs Minister. 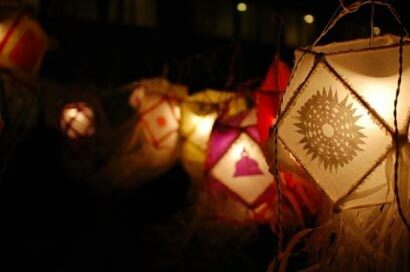 The ministry declared a Vesak Week from May 11 to 17. During the Vesak Week, several events which showcase religious, social and cultural values will take place throughout the district. The ordination ceremony of 57 Samanera bhikkus will be held at the Medirigiriya Watadageya premises at the auspicious time of 9.30 a.m. on May 13. Parents of eight low-income families who offered their sons to be ordained at temples in Polonnaruwa will be provided with eight dwelling places at a cost of Rs. 1.6 million, Buddha Sasana and Religious Affairs Deputy Minister M.K.A.D.S. Gunawardena told the media at the ministry in Colombo yesterday. In line with the Vesak Festival, schoolchildren and adults will observe Sil. The Organising Committee has taken measures to provide all requirements including alms, water and sanitary facilities to those participating in this Seela Vyaparaya. Polonnaruwa District Secretary Nimal Abeysiri said all measures have been finalised to hold the event highlighting Buddhist religious values. He said in line with the Vesak Festival, 115 houses will be gifted to low-income parents of Samanera Bhikkus under the Budhu Puth Mavupiya Upahara Housing Project. Abeysiri said a Vesak Maha Perehera which will includes tuskers will be held on May 17. Buddhists should give priority to Prathipathi Pooja rather than Aamisa Pooja during the Vesak season as Vesak Full Moon Poya day symbolises the Birth, Enlightenment and the Passing Away (Parinirwanaya) of the Buddha, Kelaniya University Chancellor and Samastha Lanka Sasanaraksaka Mandalaya Chairman Venerable Velamitiyawe Kusaladamma Thera said. Meanwhile, a Vesak Zone will be held for the fifth consecutive year in Jaffna under the theme Yapa Patunai Daham Amavai by the Sri Lanka Army, where a pandal with more than 60,000 bulbs will be on display from May 14 to 20. The Rehabilitation and Prison Reforms Ministry will organise a Vesak Zone from May 14 to 17 at Samanala grounds, Galle. Meanwhile a Vesak celebration will be held at Ashrma Hall on May 14 presided over by Ven. Professor W. Wimalaratana Thera.